For many crops, you don’t have to search very far to find a nice summary chart of the major genes involved in economically important traits. This kind of information makes breeding decisions a lot easier. Knowledge of the genetics underlying traits allows the breeder to identify varieties that are homozygous for a particular trait and to use those varieties to produce predictable progeny. Unfortunately, no such thing exists for potatoes as far as I have seen. This surprised me, because the potato is one of the most studied of all food crops. However, potato breeding also doesn’t have the same kind of following among amateurs as do crops like tomatoes, peppers, and corn, so there is less demand for easily digestible information. The flower joint in this variety has a purple band, indicating that the genotype is one of the dominant forms of B. Variants A – D of the B locus all produce color at the flower joint in the presence of dominant P or R.
That leaves the scientific literature and there is plenty of it. 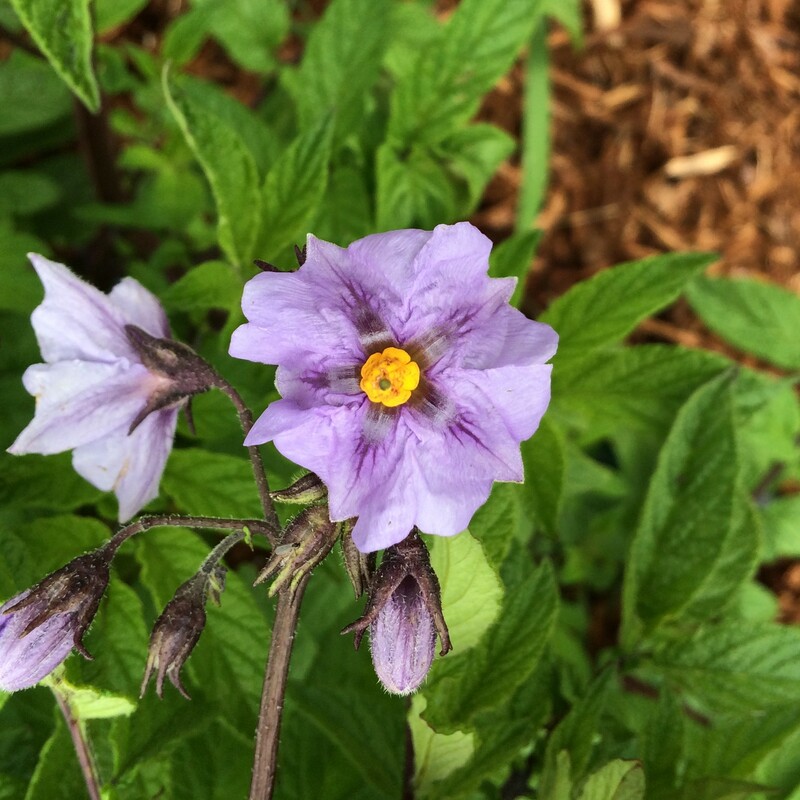 Unfortunately, as is the case with the taxonomy of potatoes, there are multiple systems that have changed with time and that also have been applied differently for diploids and tetraploids. I’ve done my best to pull together the most current information here in a way that unifies the treatments of both diploids and tetraploids. I’m taking the approach suggested by De Jong (1991), of using the diploid classification scheme (Dodds 1955, 1956) in preference to the earlier tetraploid scheme (Salaman 1910) wherever possible. Where there are popular alternatives, I’ve noted them. Diploids and tetraploids have the same genes, but some of them may not function in the same way in tetraploids, where additional copies of the gene can result in the trait almost always or almost never being expressed, or being expressed in an intermediate form. For a review of how ploidy can affect gene expression in potatoes, see Potato: Genetics – The Basics. Potatoes make life complicated for the breeder in several ways. Many potato traits are quantitative rather than qualitative. Qualitative traits are well represented by classical, Mendelian loci. Quantitative traits are determined by the interactions of complexes of quantitative trait loci (QTLs). What’s the difference? At the biochemical level, these are really the same thing, but the outcome that the breeder experiences is quite different. A Mendellian locus controls a single trait in a dominant/recessive regime. A good example of this in potato is the P gene. Dominant P- turns on purple anthocyanidin production and recessive pp turns it off. 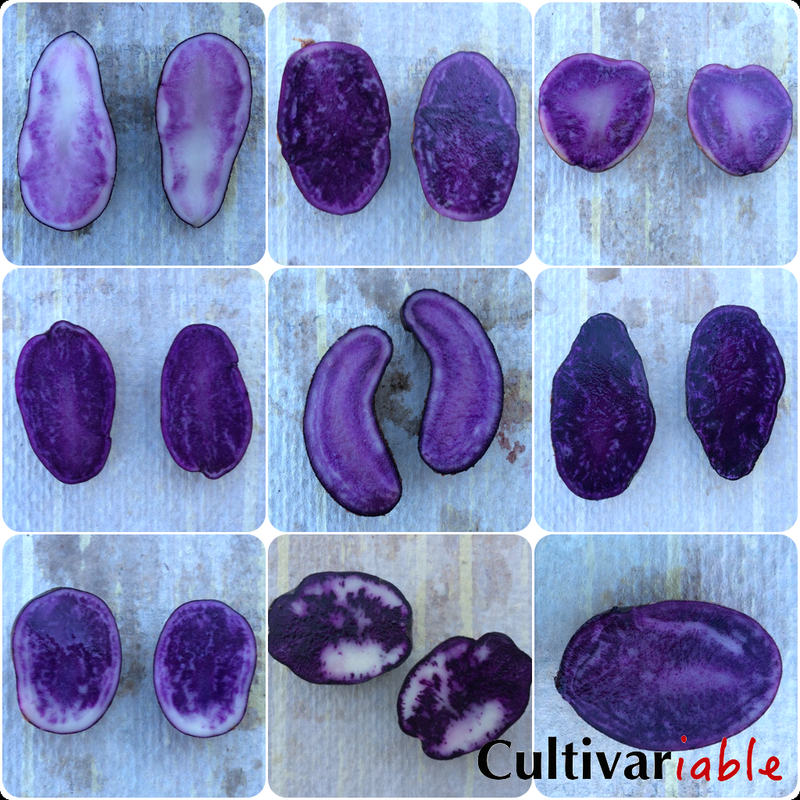 While you may not get purple tubers even with dominant P due to the involvement of distribution genes, you will never get purple tubers with recessive pp. A QTL is usually part of a group of loci that collectively determine a particular trait. It might be necessary to have several different genes all in the right state in order for color to be expressed at all, or the genes might be additive, each affecting the intensity of the color. In some cases, the qualitative genes described here are supplemented by other quantitative genes, which usually are not as well understood and certainly not as easy for the breeder to work with. 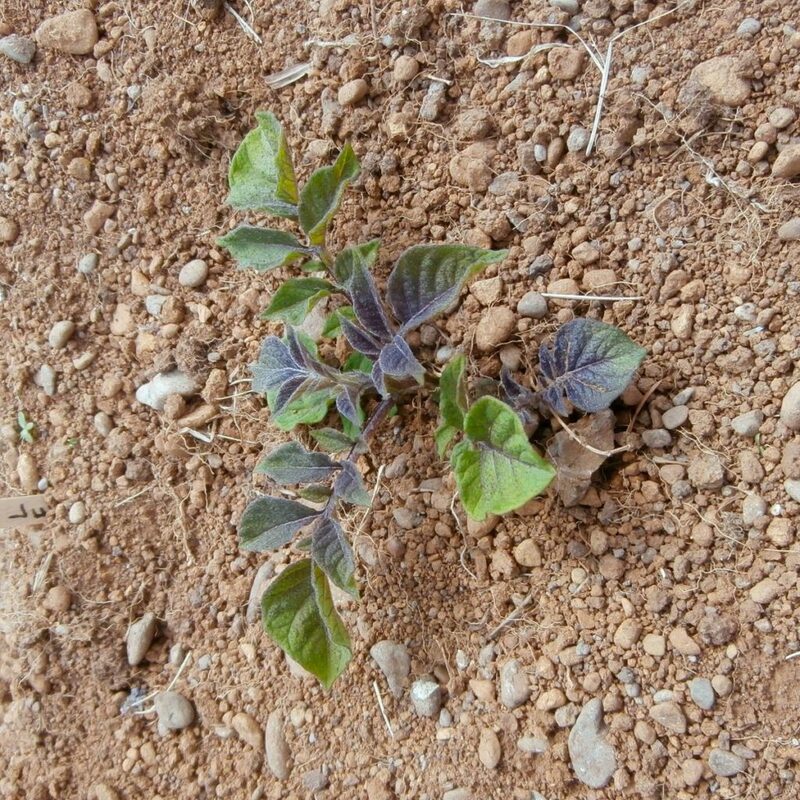 The purple color in this emerging potato plant is an indication of the Pw allele. Another problem is the presence of multiallelic loci. Multiallelic loci contain three or more alleles and therefore cannot be analyzed in the binary fashion used for the more common biallelic loci. B is an example of a multiallelic locus, with five alleles identified to date. Typically, these alleles operate in a winner take all fashion, with the highest valued allele taking the dominant position, but unusual things can happen with increased dosage in polyploids. It is likely that I have made mistakes and, particularly, oversimplifications in this post. The relationships between diploid and tetraploid genetics are not always as clear as I have made them out to be. The evidence for some genes is better than others. Informed by my experience, which is not exhaustive, where I had to make a choice between improving the practical usability of this post or emphasizing uncertainty, I have generally chosen the former. I have proceeded under the assumption that diploid and tetraploid genetics must be the same and forced the systems to line up accordingly. For a more cautious review of potato color genetics, see De Jong (1991). There are two main types of color genes: those that control the production of a pigment and those that control the distribution of a pigment. The following table summarizes the main qualitative color genes in the potato and their interactions. B Bd/Bc/Bb/Ba/b 10 Controls distribution of pigmentation to flower abscission zone (Ba-d), eyebrow (Bb-d), seed spot (Bc,d), and petiole base (Bd). Recessive bb blocks color distribution to all of these locations. Only functions with dominant P or R, as pigments are otherwise not produced, so cannot be distributed. Bc and Bd have been observed only in diploids (Dodds 1962). I (D) I/isp/i (D/d) 10 Controls distribution of color to tuber skin. Intensity of color may be in part dosage dependent on I, so tetraploids can display wider gradation. The genotype Iisp produces spectacled tubers with non-pigmented regions around the eyes (Dodds 1962). I is often used when discussing diploids and D for tetraploids. Because tetraploids are more common, D is more prevalent in the literature. E/e has also been used and appears to be nearly synonymous. In diploids, I is epistatic to Pf; neither skin nor flesh color will develop with recessive ii. Sometimes divided into Ico and Iep, for cortex and epidermis, respectively, although this doesn’t appear to be commonly used. F F/f 10 Distribution of color to flower. Homozygous recessive configuration (ff) causes reduced distribution of color to the flowers. Only functions with dominant P or R, as pigments are otherwise not produced, so cannot be distributed. P P/p 11 Controls purple/blue pigmentation through the productions of anthocyanins (petunidin derivatives). P- produces color, pp does not. P is epistatic to R; more purple pigments are produced than red, even when R is also dominant. It is important to note that red pigments are not turned off, just produced in lesser amounts. Pv Pv/pv (Ul/ul) 10 Pigmented ventral side. Controls distribution of red and purple pigments to undersides of leaves Pv is used with diploids and Ul with tetraploids, but they appear to be the same thing. Pw Pw/pw 10 Pigmented whorl. The young foliage, particularly at emergence, shows red or purple pigmentation. Used with diploids; unclear how it applies to tetraploids. The effect of this gene is best observed in newly emerging foliage. R R/Rpw/r 2 Controls red pigmentation through the production of anthocyanins (pelargonidin derivatives). R- produces color, while rr does not. When the Rpw allele is present in homozygous configuration, the plant produces peonanin instead of peonidin, and this results in pink color rather than red (Howard 1970). Also previously described as D.
Rpw suppresses cyanidin and produces white flowers (Dodds 1962), but I presume only when homozygous. 4 Controls pigmentation of leaf veins, petioles, and stems. 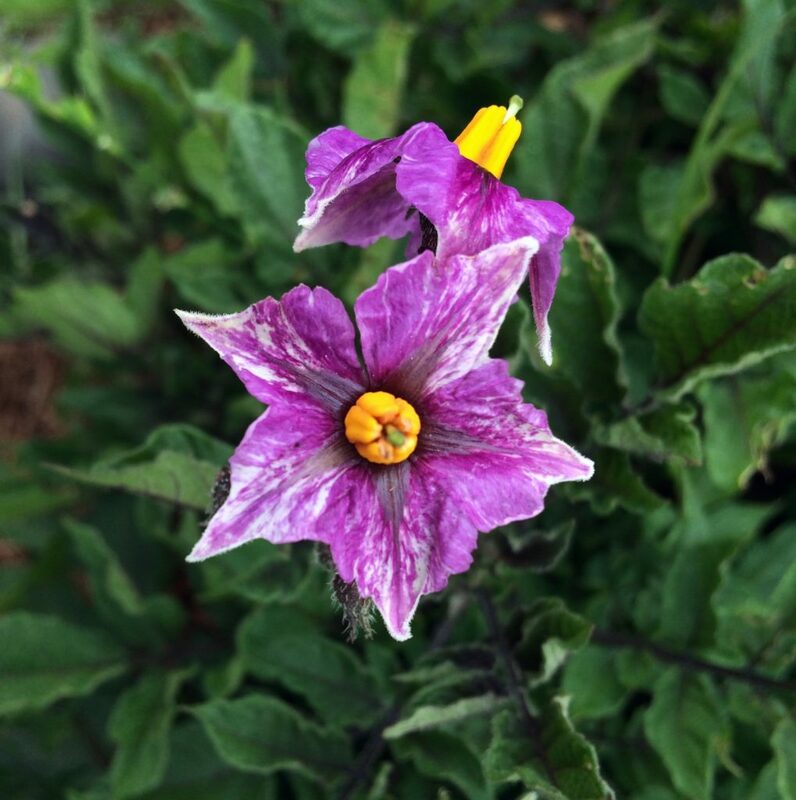 This locus was discovered in the wild potato Solanum venturii. It is unknown whether it functions in domesticated potatoes, but it seems likely. Presumably, color is only produced by this locus when P is also dominant. Genes that are located on the same chromosome may be inherited together. The major color distribution genes are all on chromosome 10 and are often inherited as a group. This is known as linkage. It isn’t certain that they will be inherited together because recombination swaps large portions of a chromosome in the process of sexual reproduction, but linkage is always possible when genes are located on the same chromosome. The following table shows example genotypes for different tuber skin and flesh color combinations. I almost added this table when I first wrote this article, but decided against it because it is fraught with peril. Some of these genotypes are probably right in theory but wrong in practice. It is also almost certain that I have made mistakes in here. But, many of the questions that I have received about the article center on how the different genes fit together to produce different phenotypes, so I think it is worth the risk of total humiliation and rejection by my peers. The dash in some genotypes is a wildcard. So, for example, in a diploid, if you see P-, that means PP or Pp. In a tetraploid P- could be PPPP, PPPp, PPpp, or Pppp. Wildcards tell you that a dominant allele is at work. The P locus controls production of petunidin, an anthocyanidin that produces purple coloration. The R locus controls production of pelargonidin, an anthocyanidin that produces red coloration. P is epistatic to R; when both are dominant, purple color is produced rather than red. This is thought to be due to competition between the two genes for a precursor involved in anthocyanidin production. Like anthocyanins, anthocyanidin structure is affected by pH and temperature. At higher pH and/or temperature, color may not be as vibrant (or in some cases, not present at all). 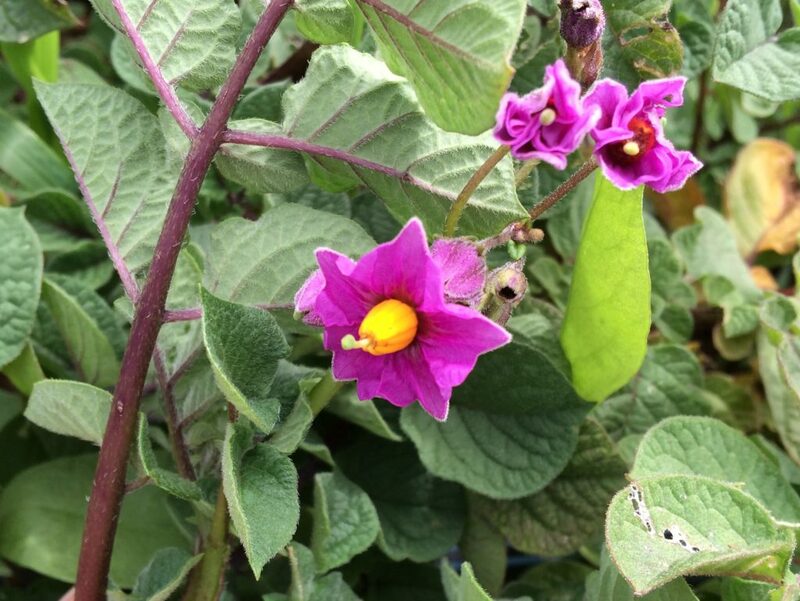 Purple pigments are found in some wild species, but only the domesticated potato has red pigments (Dodds 1962). Purple and red pigments are distributed to the skin when I is dominant. In the case of homozygous recessive ii, purple and red pigments are not distributed to the skin even if P and/or R are dominant. Purple and red pigments are distributed to the flesh when Pf is dominant. 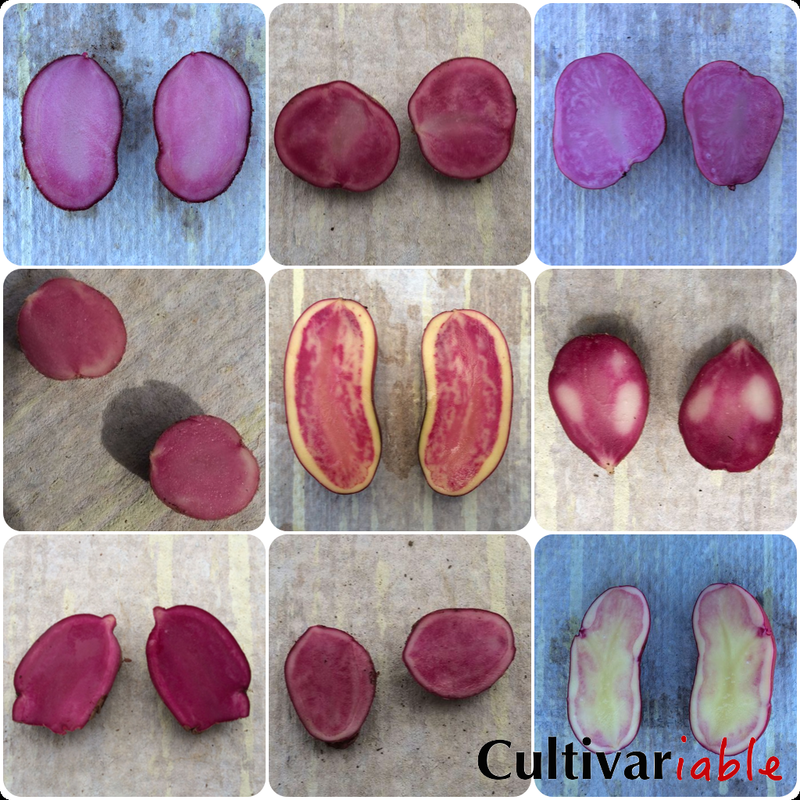 In the case of homozygous recessive pfpf, diploids do not distribute red or purple pigments to the tuber flesh. Little information is available about the operation of Pf in tetraploids. A particularly dark purple pigment, malvidin, is found only in certain tetraploid potatoes, like Negresse (also known as Congo, but not to be confused with the Congo that is synonymous with All Blue). Simmonds (1965) hypothesized that this pigment was formed by a second methylation of petunidin and that this was controlled by a similar gene to Ac. He also noted that a petunia gene, K, performs the same function. Why this is only seen in tetraploids is uncertain. This could be another allele of Ac but is probably not a tetraploid dosage effect because it was produced in a dihaploid cross. There are additional QTLs affecting red and purple flesh color. Loci that influence flesh color have been identified on chromosomes 5, 8, and 9. More detailed information about the operation of these loci has not yet been published as far as I am aware. Several recent papers have described a fairly large number of QTLs affecting tuber flesh color. Amateur breeders probably don’t need to be too concerned about this; the P-R-I complex gives reasonably good predictability. It is enough to be aware that there may be other genes at work if a cross does not conform well to expectations. With a better understanding of all of the involved genes, we could get better predictability of completeness and intensity of pigmentation, but it doesn’t seem like this information will be available in an easily digestible form any time soon. There is a flowchart showing red and blue phenotype outcomes at the bottom of this article. Yellow and orange flesh are fairly common in Andean potatoes, but not often seen in modern varieties. Because yellow skin and flesh often occur together, my assumption is that the same genes control yellow/orange skin and flesh, although I haven’t seen a single paper that addresses this. Historically, the multiallelic locus Y has been implicated in expression of both orange or yellow flesh. Or (orange flesh) is dominant over Y (yellow flesh), which is dominant over y (white flesh). Or favors production of zeaxanthin over lutein, Y lutein over zeaxanthin, and homozygous yy produces little of either, resulting in white flesh. Yellow flesh has also been found to be a quantitative trait with a number of different QTLs involved that affect intensity. I have searched, but not found any accounting of what occurs when both R or P and Or or Y are dominant. From experience, I know that yellow pigments and red or purple pigments can express together, but I don’t know the details. It is also not clear how the Y locus interacts with the various color distribution loci. Again, I know from experience that yellow or orange pigments can sometimes appear in the leaves, but I found no information indicating whether this is controlled by the distribution genes covered above or by different mechanisms. In practice, I have never seen a cross result that made it appear that orange flesh is dominant; instead, orange flesh almost always gives way to less intense yellow flesh. As noted above, including Or in this locus is now considered dubious. More recent information (Wolters 2010) indicates that orange is developed primarily through the combination of a homozygous recessive pairing of the Zep gene allele 1 (involved in zeaxanthin production) and Chy2 gene allele 3. Very few tetraploid potatoes contain Zep allele 1, which limits the possibility of orange flesh in tetraploids without bringing it from diploids. The B, I, and F complex controls distribution of pigments to many parts of the plant. These genes probably only distribute purple and red pigment, not orange and yellow, although I have not seen this stated explicitly. B, I, and F comprise a linkage group. They are often inherited together. Ba-d distributes color to the flower abscission zone. This is the joint where the flower connects to the peduncle. There is usually just a small ring right at the joint. In the case of homozygous recessive bb, the joint is the same color as the rest of the inflorescence. Bb-d distributes color to the tuber eyebrows – the arc shaped structure next to each eye. In the case of homozygous recessive bb, the eyebrow may not be colored when the rest of the skin is. Bc-d distributes color to the seed spot or embryo spot. This is actually the cotyledonary node, where the hypocotyl is joined to the cotyledons. In the case of homozygous recessive bb, there is no seed spot. The seed spot is so named because you can see the pigmentation through the seed coat. This allows for screening for seeds that have this trait, which can be particularly useful when it is linked to other traits of interest. Bd distributes color to the nodes on the stem and possibly also the tuber. In the case of homozygous recessive bb, the result appears to depend on whether the stem has red or blue color, in which case colorless bands can appear at the nodes. This may also extend into cleared spots around the eyes if the tuber skin is colored. I (D) distributes color to the tuber skin and appears to be dosage dependent. For example, you would expect stronger color in an II diploid than in an Ii. Similarly, in tetraploids, the tubers of a plant with IIII would likely be much more strongly colored than a plant with Iiii. In diploids, I also controls expression of colored flesh (Pf). In the case of recessive ii, tubers will not have colored flesh even if Pf is dominant. Distribution of color to flesh in tetraploids is more complicated and I have not seen it clearly elucidated anywhere. While these alleles serve as a reasonably good guide to the possibilities, the book is far from closed on this subject. 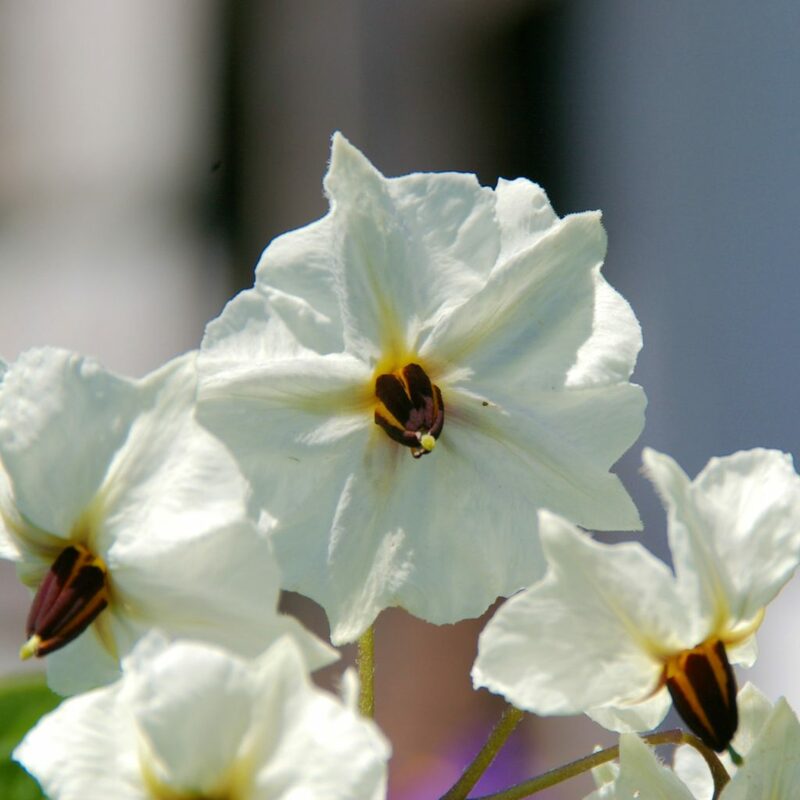 For example, there are some Andean potatoes that are entirely white or yellow on the outside but have blue flesh. This combination does not fit with the options described above. It is good to keep in mind that most of the alleles described have not been determined through biochemical analysis; they are abstractions based on morphological observations and statistical analysis of progeny out of controlled crosses. In that sense, they may not be “real” even though they are useful. R-ppF- Pink corolla Red/purple because only R is expressed. Additionally, the color of the flowers is reddish-purple, rather than pure red, because the gene R produces the cyanidin in the flowers vs pelargonidin in the tubers (Howard 1970). rrP-F- Blue corolla Blue because only P is expressed. R-P-F- Purple corolla Blue/purple because P is epistatic to R, but R is still able to contribute some red pigment. Usually white because ff blocks pigment distribution to the flower, but sometimes produces flecked flowers, perhaps due to interaction with another gene or a leaky allele. rrppff White corolla White because ff blocks pigment distribution to the flower but also because there is no pigment produced. No possibility for flecked flowers, despite homozygous ff, because there is no pigment to distribute. rrppF- White corolla White because there is no pigment to distribute to the flower. RpwRpwP-F- Pale blue corolla The combination of P and homozygous Rpw produces pale blue flowers according to Dodds (1955). I’m not sure if I have seen this color. The chart applies to diploids, which are more straightforward to predict. Tetraploids have four copies of each allele, which can result in some intermediate phenotypes. 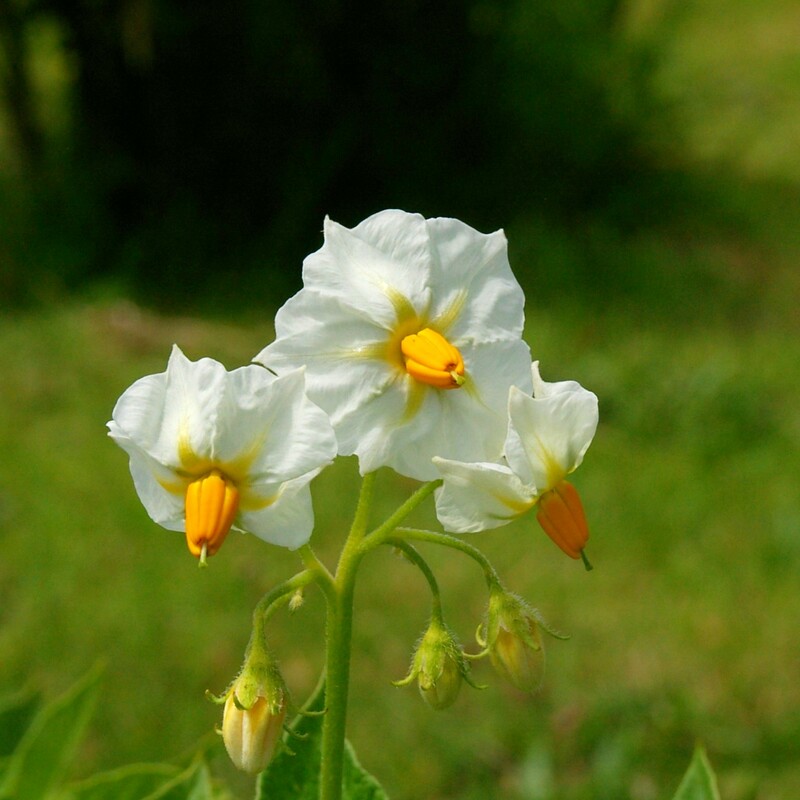 Very rarely, potato flowers can also be light yellow. I have found no information about the genetics of this flower color. It is probably too rare to have been studied. My best guess is that this trait comes from crosses with wild potato species, some of which have yellow/white flowers. Although anther color is related to overall pigment production, I have not found any clear explanation of its inheritance. It is not included within the F locus. For example, I have several potatoes with red skin and flesh, but white corollas. That presumably puts them in the R-ppppffff genotype, but they also have red anthers, so ffff is clearly not blocking distribution of red to the anthers. Or, perhaps F is affected by dosage and these are something like Ffff. I think that potatoes with red anthers always have red flesh and potatoes with blue anthers always have blue flesh, but, unfortunately, the opposite is not always true. 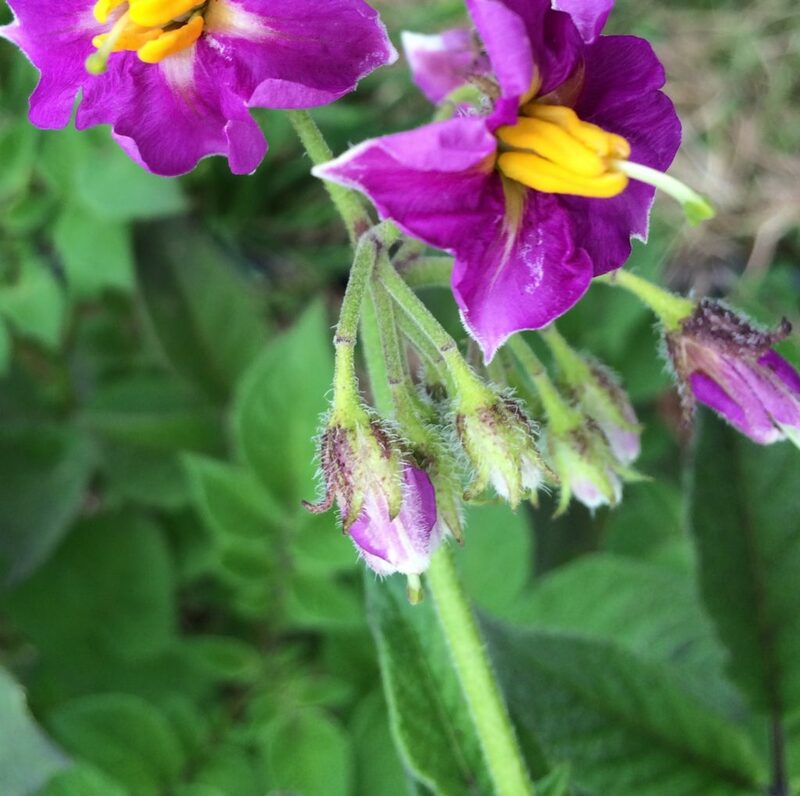 Potatoes with red or blue flesh and white corollas occasionally have yellow anthers. I have not yet seen this in combination with a pigmented abscission zone, so perhaps recessive b genotypes might explain the yellow anthers. That seems rather obvious, so it would probably have been discovered and published by now if it were true. 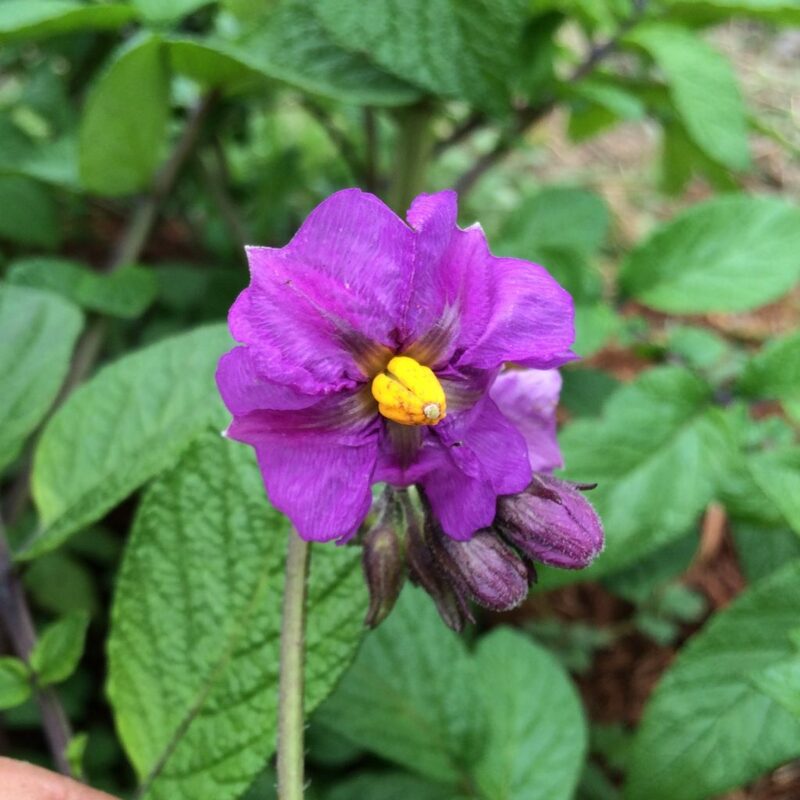 Potato anthers can be yellow, red, or purple/black and any of these anther colors can be combined with any of the corolla colors. The genetics of this feature are unknown, at least to me. Most of the foliage color distribution genes, Pd, Pw, and Pv (Ul), have been described only for use with diploids. The same genes must function in tetraploids, but perhaps they do not express in a clear fashion or perhaps they have just not been sufficiently studied. I can say from experience that foliage color seems to be easier to predict in diploids than tetraploids. Russeting is more a condition of skin structure than color, but still probably fits better in this post than on the future post that I will do on tuber shape and structure. Unfortunately, the inheritance of russeting has not received much study. The only available study was done with diploids and suggests that russeting is controlled by three independently segregating genes. All three genes must be dominant for russeting to appear. The loci have not been named. Inheritance under a three gene system may be very difficult to sort out in tetraploids. 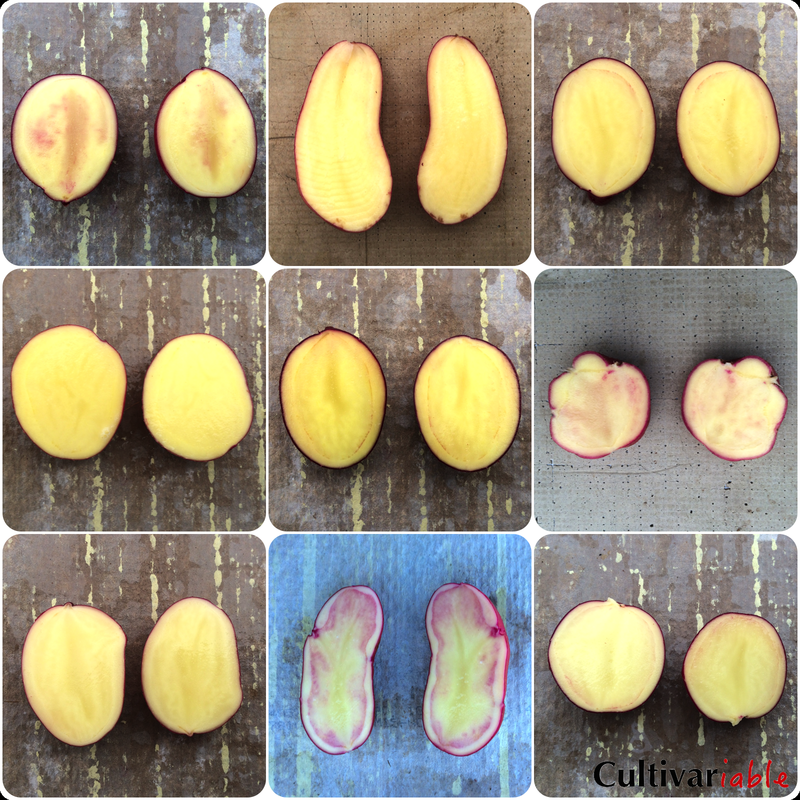 Russeting may also appear as a defect in normally non-russet tubers in calcium poor soils. The following table lists some potatoes for which the color genotype has been fully or partially determined. These varieties may be useful for making test crosses to determine the color genetics of unknown varieties. I will try to add genotypes here whenever I run across them. Genetics of red and blue skin and flesh color. I make a couple of assumptions here that may not be true, like making Pf epistatic to M, which is not supported by the literature but appears to be correct in my experience. 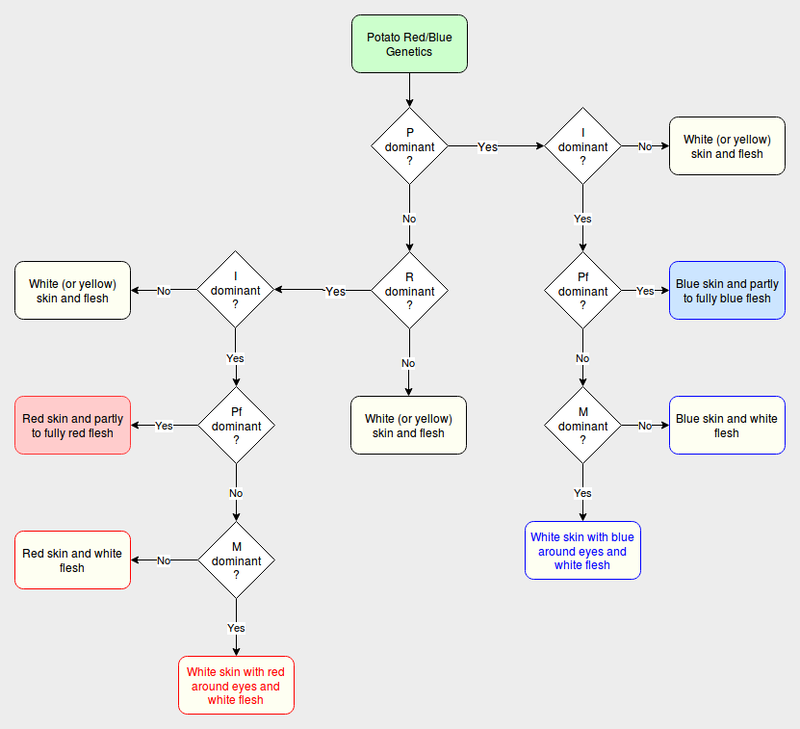 This chart does not deal with yellow color at all, so any outcome that specifies white could also include yellow. 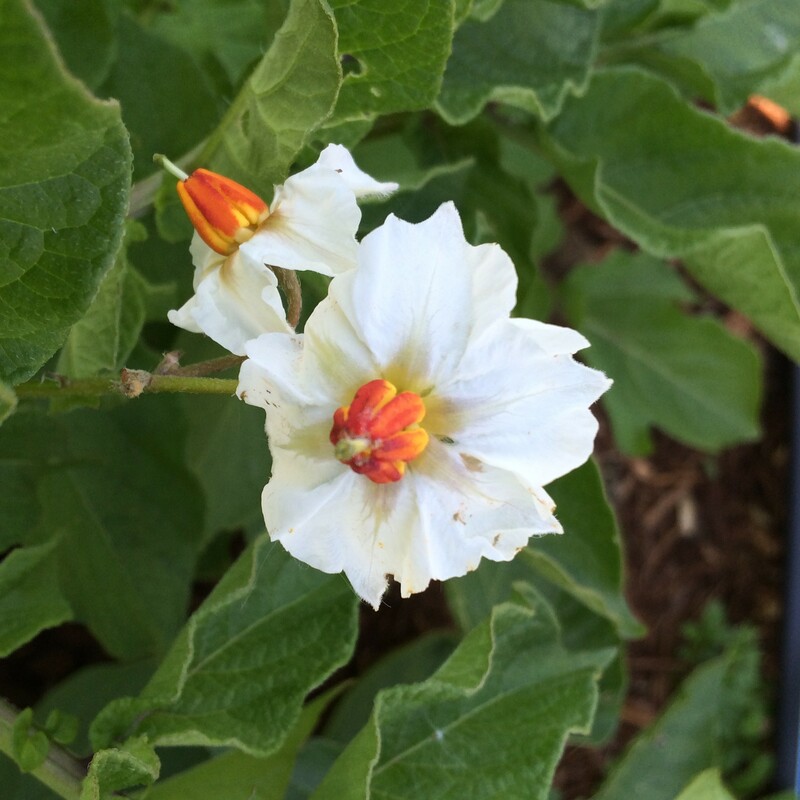 This entry was posted in Blog, genetics, potato (Solanum tuberosum). Bookmark the permalink. I found this page because I started putting together a potato colour genetics chart like this. It was taking me some time because, as you said, this information is scattered across scientific literature. Looks like you beat me to it and did a great job. I am so glad I found this page as this is an excellent resource (and there is no point reinventing the wheel). Thank you! Is anybody have an idea why Red Norland would show white and red skin areas at harvest ? The white is really white, and the red is also the good red color. – or a combination ? I would need to see it, but the most likely explanation is a somatic mutation. Potatoes produce chimeras fairly frequently, where there is either a mutation that changes the color or exposure of a different layer of the epidermis that has different color. When these mutations are stable, they can be used to select a new variety, which is known as a “sport.” If there are any eyes in the white skin area, you should be able to start plants from those eyes that form only white tubers. Fascinating. “There’s no such thing as a red potato in the flesh, and why is that?” I said at the dinner table, and as usual I was wrong about what there is such a thing as. I see now there are some commercial red-fleshed varieties.